General William Madison was the first European inhabitant of the land that Woodberry Forest School now occupies; he was also the first of hundreds of men connected to Woodberry who have served their country. In her article, “With a View to Service” in the Fall 2010/ Winter 2011 issue of the Woodberry Forest Magazine and Journal, Linda Larson Hogan explores Woodberry's military history and profiles several alumni who have served in our armed forces, going back as far as World War II. 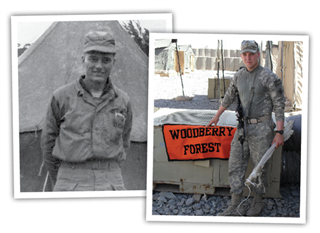 Woodberry would like to recognize all of our veterans and active servicemen. We hope to eventually list all of our military alumni; we want to include the stories, pictures, and videos that our military alumni want to share. Collected and displayed in the following webpages is information about alumni who have served in the military over the past eighty years. If you are a veteran or active serviceman, we need your help. Please send us a photo of yourself in uniform (combat or formal) and tell us your name, graduation year, current rank (or rank when you retired), where you've served, and any medals or commendations you've received.